Sattu must be a new name for most of you but don't just be fooled by it's simplicity, it is one of the wonder foods that I know. 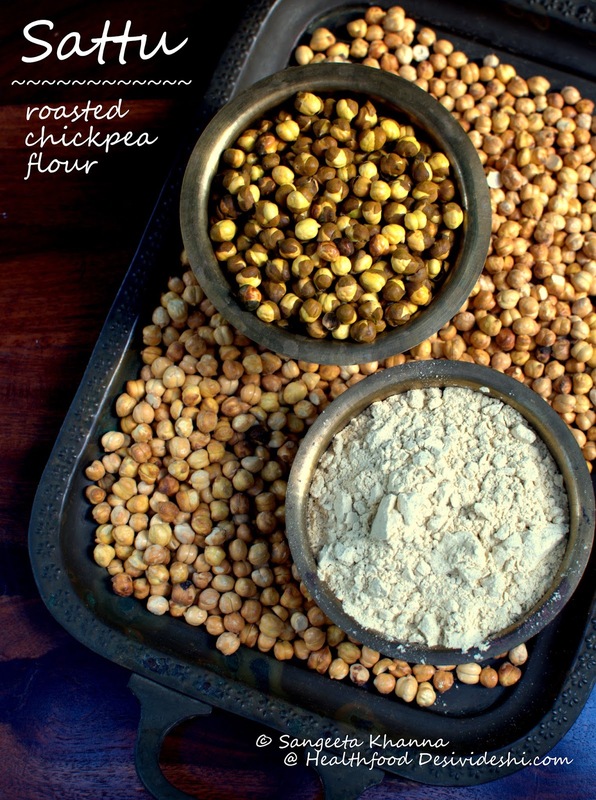 I am sure you don't need any introduction to chickpeas but roasted chickpeas flour is not a very common ingredient in other parts of the world. The roasted gram flour originates probably from Bihar, but is equally popular in eastern UP as well. You must be curious about the flour if you haven't already tasted it. We normally get roasted chickpeas coated with salt and pepper or chaat masala in the supermarkets and have it with our evening tea. Yes, teacakes and scones are to English teas what the savories, namkeens and such roasted chana is for Indian masala teas. 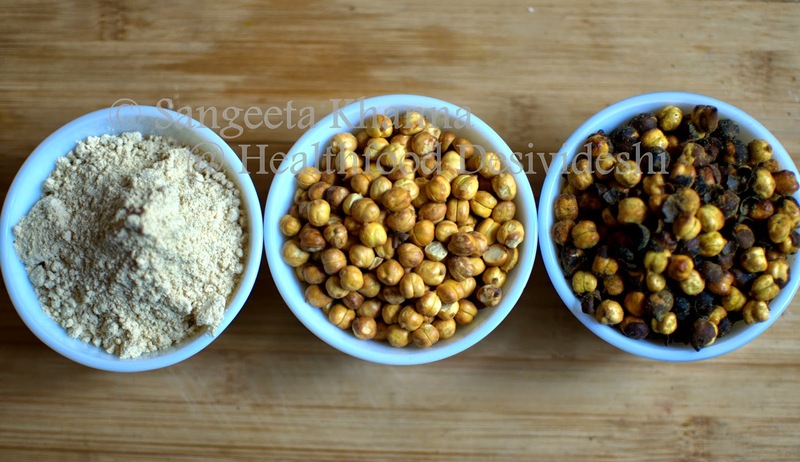 So the roasted chickpeas with skin on the extreme right is used as a savory snack, the middle one is plain unsalted and skinned roasted chickpeas which is used mostly for making chutneys mixed with coconut, curry patta and green or red chilies etc. This skinned plain roasted chickpeas can be ground to make sattu or roasted chickpeas flour at home using you trusted mixie or coffee grinder. It is very convenient to do when you don't get the ready sattu in your part of the world. 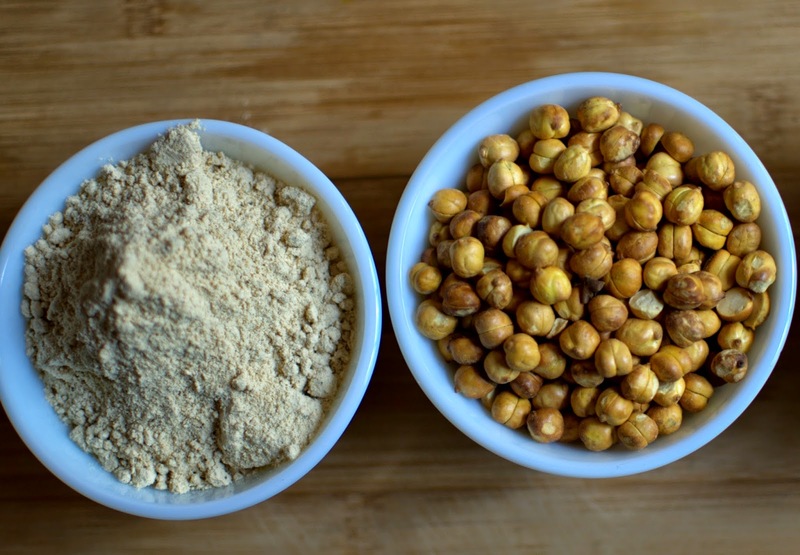 The extreme left in the picture is roasted chickpeas flour that is sattu. Sattu ka sharbat, both sweet and salty varieties, is sold as a cooling drink during hot summers in some small towns of eastern UP and Bihar, even in Calcutta. Sattu can be milled using roasted chickpeas with skin as well, enhancing the fiber content in it, but I find it too grainy so sometime I add half skinned and half with skin roasted chickpeas in my sattu. A roasted barley flour is also available in markets and specialty health food stores and that is called Jau ka sattu in Hindi. Both the flours are cooling in nature but chane ka sattu or roasted chickpeas flour is considered to be a tonic food also. Farm laborours were given sattu, raw onion and jaggery as their mid day meal in olden days, they used to do hard work in scorching sun, this food was cooling for the system, hydrating and stamina building. It is absolutely gluten free too. Sattu is considered strengthening, cooling, light meal that doesn't sit heavy on your system and even helps detox as it is quite rich in soluble fiber. Normally it is consumed with raw onion and chopped coriander greens so the cleansing effect of the meal is even better. The best thing about sattu is, it is a great food for babies, adults and even old people as it is light to the digestive system and yet very nutritive. High on Iron, Magnesium and Manganese, low on Sodium, low on Glycemic index makes sattu a favorable food for diabetics and for weight watchers as well. Here is a savory drink made using sattu and mint powder along with some finely chopped raw onion...absolutely cooling, cleansing and yet filling. 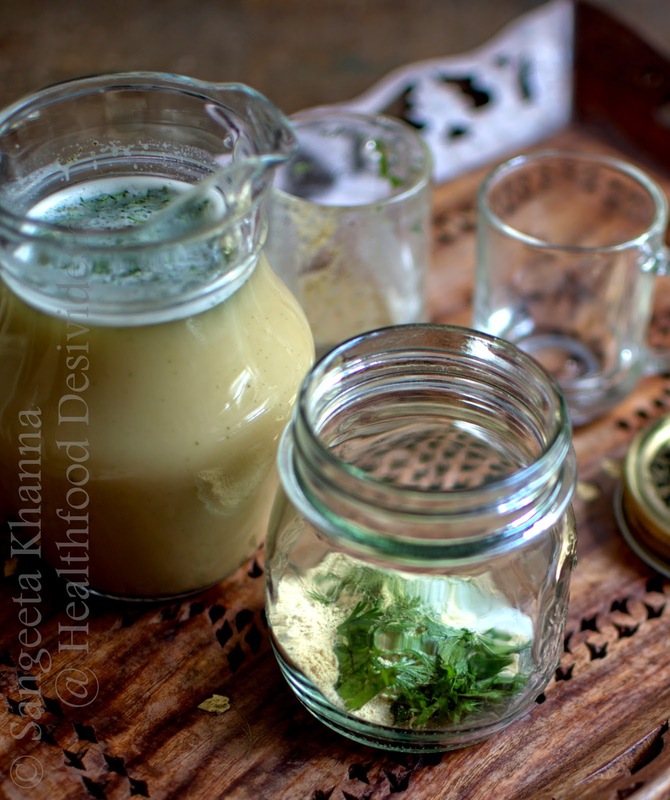 For 2 servings of this drink, dissolve 2-3 tbsp of sattu in 500 ml of chilled or cold water, add 1 tsp of mint powder (or fresh mint paste as per taste), salt to taste, lime juice to taste and 1 tbsp of finely chopped onion. Mix everything together and a refreshing drink is ready. You can carry this drink to your office in a jar or sealed tumbler. Mix the dry ingredients and fix the lid. Add chilled water, mix and have it fresh. I sometimes add chopped coriander greens to the drink as well. And we can have sattu like a solid food as well. The same ingredients are mixed with lesser water to make it in a porridge or upma consistency. Topped with chopped onion, coriander greens, green chilies etc, it makes a yummy filling meal. 3-4 tbsp sattu can make a filling quick fix meal better tasting than instant noodles. 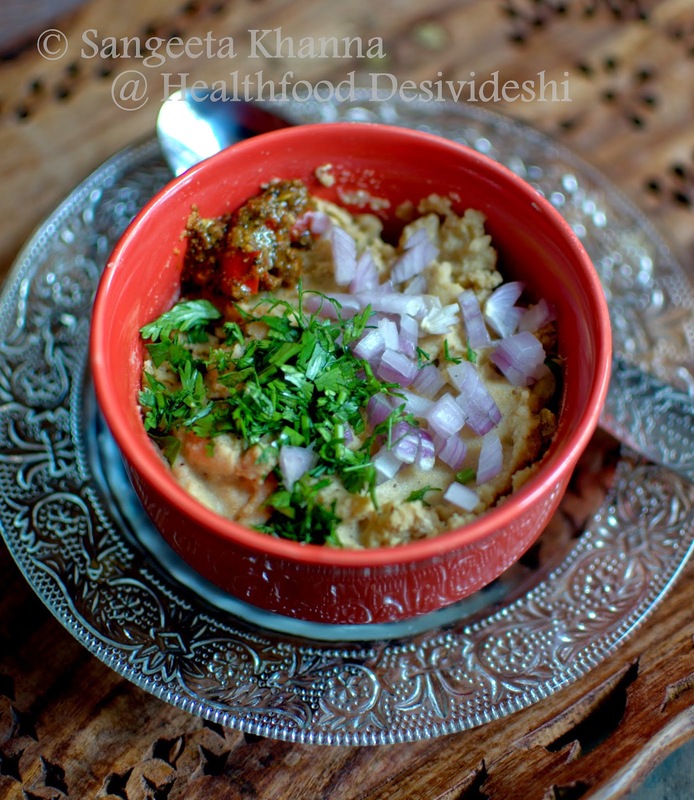 A dollop of laal mirch ka bharva achar (stuffed red chilly pickle) is served with this porridge sattu mostly. Heavenly combination it makes. The aroma of sattu is spectacular in it's effect. You would know when you mix all the ingredients as you would immediately feel like having it. Others in the home will also be drawn towards the kitchen believe me. And this when no cooking is being done. Isn't that wonderful? 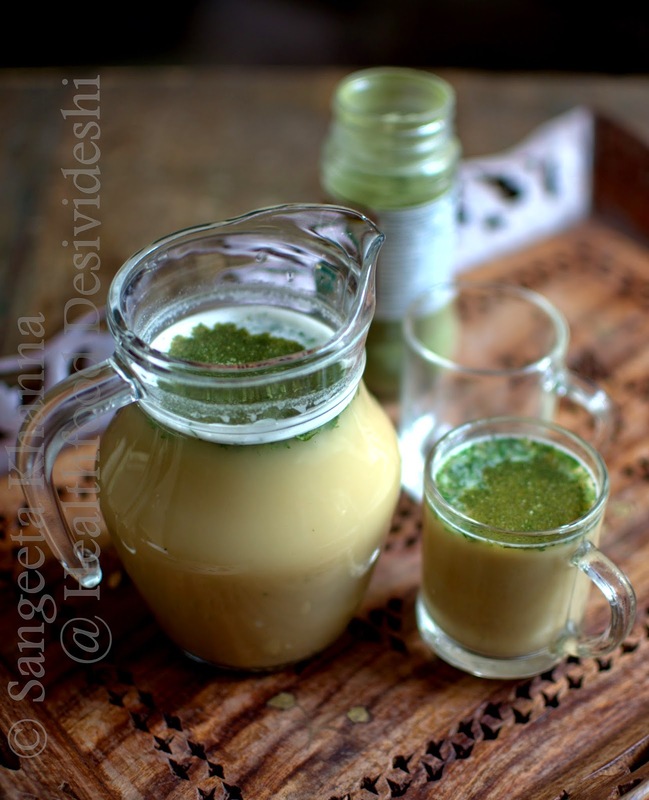 There is another way to include sattu for convenience and nutrition. This is how my grandmother used to quickly mix up a tasty snack for us after our play time in childhood sometimes. Some desi molasses for sweetening, some ghee for binding and sattu, just three ingredients, no cooking and a tasty quick snack ready. 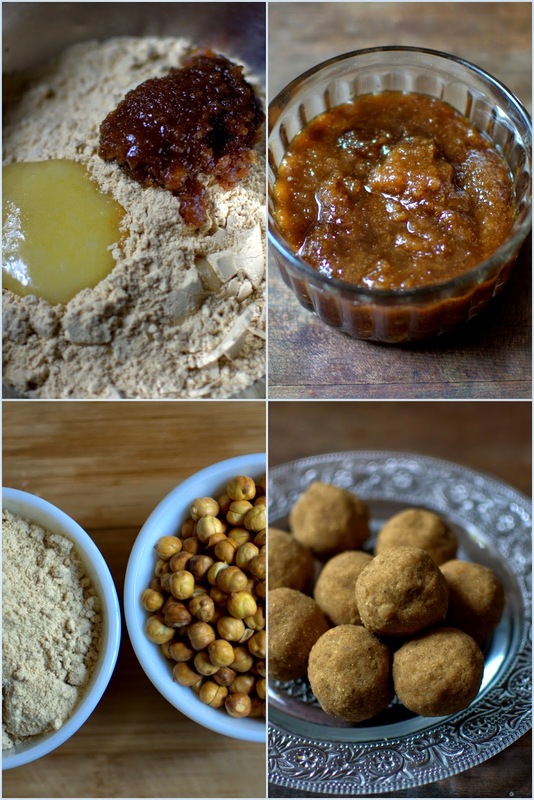 Just rub 2 tbsp of molasses or honey if you don't get (desi molasses), 1 tbsp of ghee in a cup of sattu, and bind it to make a few round laddoos (balls). Isn't it a great ingredient to have in your pantry? I do a cheat chutney with sattu as well. Mix equal amounts of sattu and dessicated coconut powder, add yogurt and whip to make a thick chutney, season with salt and temper with a littl sesame oil, hing, mustard seeds, red chilly and curry patta and a nice spicy chutney is ready for your idlis or dosa. And we make a sattu ka paratha as well. Do try that for a nutritious family meal sometime. Do you use this ingredient? How often? Use it more if you already do. My brother gre up on sattu..literally, we used to give him packets of sattu in his school hostel which he used to have as in between meals with puffed rice(moori) and water mixed. Been a while since I dropped by..
liking the new look of your blog. its soothing. with the sattu i had made drinks sometimes. really good. i am liking the laddoos. i think even melted jaggery would work to make these awesome laddoos. I love sattu drink & have grown up on it a lot during summers... first time visiting your space.. great place.. This new look is quite nice and neat. We have had quite a few friends and relatives from bihar and eastern UP who have waxed lyrical about the benefits and qualities of sattu but somehow I have never had it ever. I like this laddu immensely. I presume that there is no cooking involved in the preparation of this laddu? No cooking at all Amrita. Just mix and bind. Isn't it great? Reading this again with 'new eyes'. Can do most of what you suggest, and everythig sounds yum. 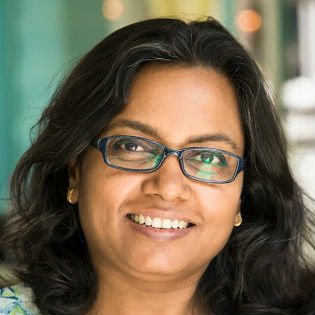 sattu ka cheela? Is that possible too? although hara bhara kebab (posted here long back) uses sattu as a binder, sattu wont bind on it's own to make cheela.. 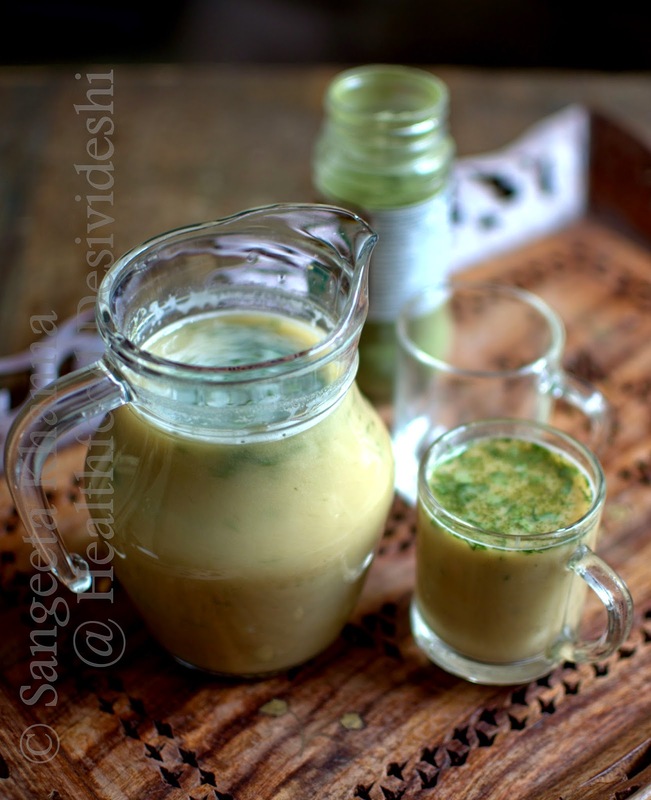 I have been meaning to try sattu but did not have any recipes to suggest use. A generic "mix into water and drink" was not very confidence inducing - but your recipes and pics here should make me do it! I will be sure to try the Sattu paranthas, a much more glamourised version of the besan paranthas I make. Oh so happy you have made a post on sattu! Truly one of the most important foods in Bihar/Eastern UP, no?! My usual quick and easy sattu drink is sattu, chilli powder, salt and lime juice mixed with cool water. So refreshing. I have heard you can make a sweet drink from it too but I just cannot get my head around that. My number one all time favourite sattu dish is litti though. Do you ever make litti? Love it even more than sattu ka paratha. Oh, and sometimes I do see a jau-chana mix sattu in the shops, but more often than not I buy the roasted chana and grind it myself. I heard originally sattu was made from seven different grains/legumes and that is where the name comes from. Bet that original sattu was tasty and very nutritious too, would love to make it if I knew what was in it. I am glad the post was useful for you SM. You get roasted chana (yes, kala chana not kabuli chana)in markets quite easily and roasting at home can be an exhausting task if you have to make it in large quantity. I have seen some small roadside vendors roasting lentils in a hot kadhai filled with sand , that process is best for large quantities and you can ask them to roast your chana too. The carts that sell popcorn and peanuts on the roadsides in north India, also use the same sand roasting method and they can also be of use if you want them to do it for you. Otherwise just watch them how they do it, use a pack of table salt instead of sand and roast your own chana. You don't need to boil the chana, just rinse it with water, let it rest covered, wait for half an hour and roast it directly in hot sand or salt. Good luck for the roasting, I will try and do a photo post soon on roasting chana and other lentils. Thanks - look forward to that post. I'm in the USA, not India. We can purchase roasted chickpeas in the Indian grocery store here; I just have to worry about any cross contamination with gluten in the roasting process... if they share equipment in the facatories with wheat products - due to my daughter's celiac disease... which is why it is safer to make my own. When we were small then Dad used to get us sattu and mom would make her recipes out of it. I am now tempted to try some of the recipes you have listed--like that porridge. I think that makes more sense than upma. And also satuu ke ladoo. What is molasses--same as gur? Molasses is the liquid which is a by product of making jaggery, richer in mineral content. How can one buy molasses? Checked at my supermarket--couldnt find it. what name should I say? Sattu is usually made using the whole barley that looks brown (with husk), which is roasted and then sieved to get the jau ka sattu. Although one can make jau ka sattu using the pearl barley or the white husked variety as well. Hi.. I love sattu roti and sattu drink..U seems to know this ingredient quite well.. So I wanted to know if its safe to consume regularly during pregnancy.. thanks. It is absolutely safe to consume sattu during pregnancy. Can be had every day. Do I have to heat salt like sand to roast the chana? Yes Kiran, fill the kadhai with a kilo of table salt and heat it just like they use sand to pop corn kernels on the roadside. This salt can be used repeatedly for the same purpose of roasting chana or peanuts or even for popping corn kernels. Hope it answers your query. Thanks for your response !!! There is one little problem, anything I roast tastes salty. ohh..try rubbing off the roasted chana or whatever you roast with a kitchen towel. This method is good for salted roasted nuts and chana in fact. Rub off any extra salt. Amazing site! Great information and pictures. I know and love sattu, even though I am from central UP. I live in USA. Every time I go home, I bring back kilos of sattu. Simplest meal ever! Till now, I have eaten mostly sweet sattu, or in litti, now I will try other recipes. Thanks. Hi.. Can we make chana sattu ke ladu or barfi? Sattu k eladdu recipe is given in this article Manu. I haven't tried barfi but you can try.